← Day 65: Picasso Exhibit at AGO. Day 66: Street Food Block Party. 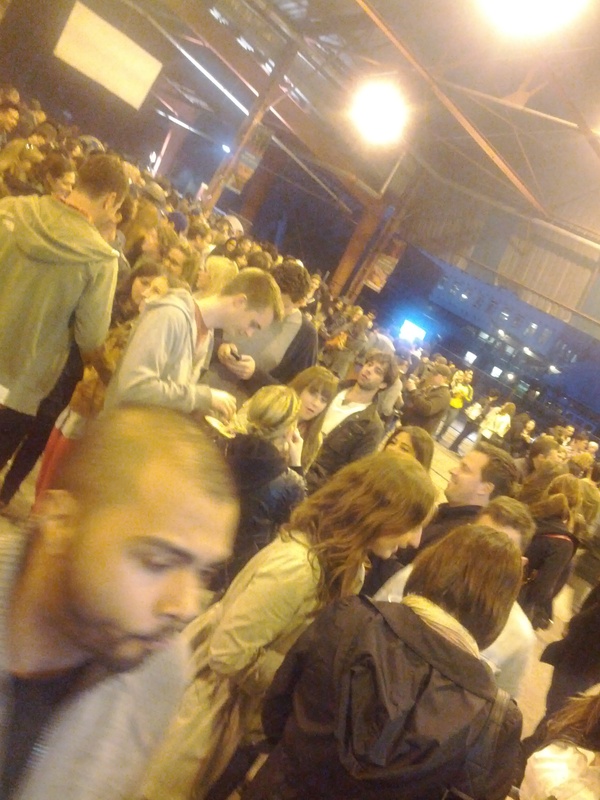 The Gorilla grilled cheese queue. 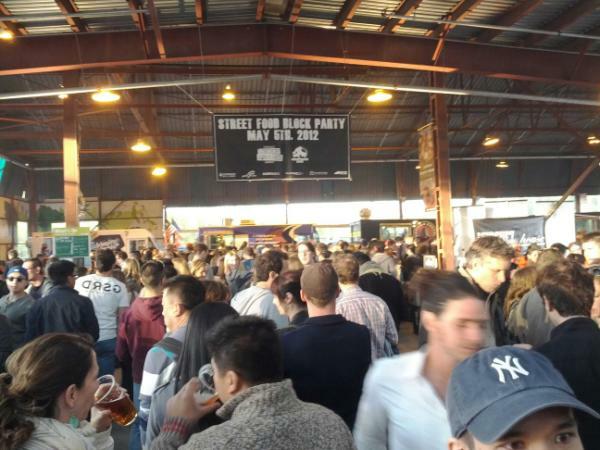 Oh what a night… The Street Food Block Party hosted around 3,000 hungry and thirsty peeps under the pavilion at the Evergreen Brick Works. The Cinco de Mayo-themed event built up quite a stir the week leading up to the event, with teasers about who the final list of vendors would be, and what dishes they would be conjuring up. I think the end result can best be summed up in two words: Sweet jayzus! Being a fan of the Toronto Underground Market, I managed to buy tickets to this event as soon as they were released on-line, and was feeling rather smug because it sold out in about an hour. My kingdom for a morsel! What I didn’t realize was the fact that 3,000 foodies would all end up targeting the same twenty street food vendors and eleven food truck vendors around the same time, which quickly translated into ridiculous line-ups. Paying for admission to a venue where we then had to queue to buy individual servings of street food? If you needed proof that I was insane, I think tonight speaks volumes. But one of the things that I love most about this city and its people is that everyone was reasonably chillaxed about it, no doubt at least in part due to the relatively swift queues for booze tickets to the precious beer and wine tables. The awesome live band also added nicely to the positive vibe. All the same, it was clear that we needed a strategy, and fast, to keep from keeling over with nothing but wine in our bellies. So, we opted to divide and conquer. Between the three of us, we covered two food truck lines, with one wine runner. It just seemed to make so much sense at the time. Food – finally!! Lobster roll so yummy! The first line came to fruition about three glasses in, and it was the one for lobster roll sandwiches from Buster’s Sea Cove. I won’t lie, I was so famished and tipsy at this point, that I probably devoured mine in all of about three bites, which also meant that I forgot to take a picture of it. Thankfully, the internet obliged, and so here is a gorgeous photo of it from another blog. In a word? YUM! 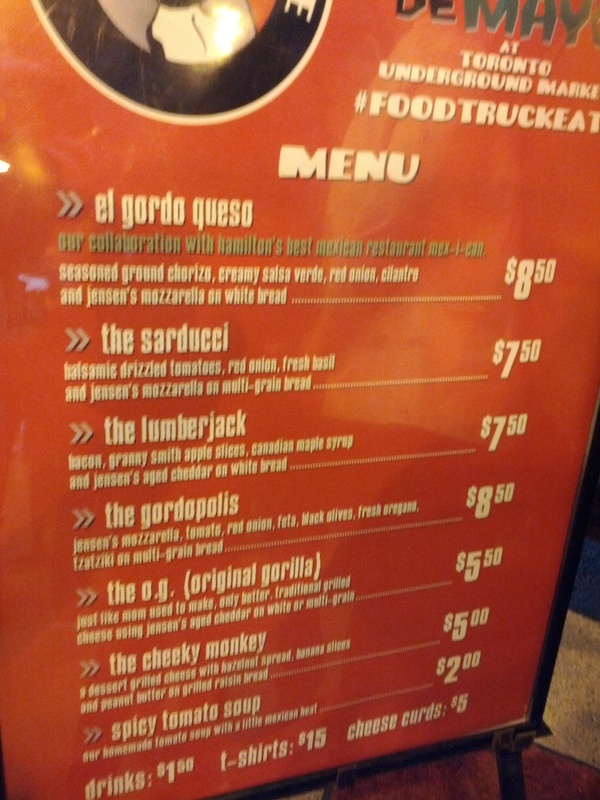 Next, we had a crucial decision to make: which grilled cheese sandwich to try from Gorilla Cheese? Oh, the agony! Nothing like standing in line for over an hour to get you questioning your gut. I finally settled on the sarducci, while my companions both decided to stick with the o.g. (original gorilla). We were not disappointed. Ooey, gooey, yet crunchy toasted deliciousness. A momentary glimpse of nirvana, which we washed down with some rather tasty red wine. Max 3 per person? Challenge accepted. Now that the room was spinning a little more slowly, we were able to peruse what the rest of the vendors had on offer. It was with mixed emotions that we discovered el Gastronomo Vagabundo had sold out of its fish tacos, as the line was still far from short. We heard praise from other guests for exotic creations such as beef bacon doughnuts, margarita doughnuts, and cakes in a jar from Sullivan & Bleeker. When I discovered there was no line at Portobello Burger, I snuck in a quick mushroom taco while one of my companions waited in line for our final bite of the evening, a cinnamon churro cupcake from Cupcake Diner. All, of course, washed down with more delicious grape juice. So wrong yet oh so right! This was about the point in the evening where we had the good sense to roll ourselves into a taxi. The only real taste that I cannot believe I missed, not that I had any place to put it, was the lobster poutine from Rock Lobster Food Co. I hang my head, and once again covet this photo that should have been mine. Hope you had an equally marvellous Cinco de Mayo, and remember that, no matter what Mr. Tequila says, he is really only there for a good time, not a long time. Enjoy the ride! This entry was posted in Food and Drink and tagged Drink, Evergreen Brick Works, Food, Food Truck Eats, May, Street Food Block Party, Toronto, Toronto Underground Market, yumtum.ca. Bookmark the permalink. 1 Response to Day 66: Street Food Block Party. By the way, check out the following great summary of other tasty tidbits that we totally missed from Toronto Life – you’re welcome!